The tourism industry has fared far better than expected in 2015, meaning that visitors to Athens can look forward to a growing selection of places to stay. After two new hotels opened their doors this year another six are on their way in 2016, testifying to the spectacular recovery of the Greek capital as a tourist destination. It sounds paradoxical, but it’s not: while the country is dealing with credit controls, an uncertain political and economic landscape and a difficult winter, the tourism industry seems to be the only sector to have so far weathered the recession unscathed. 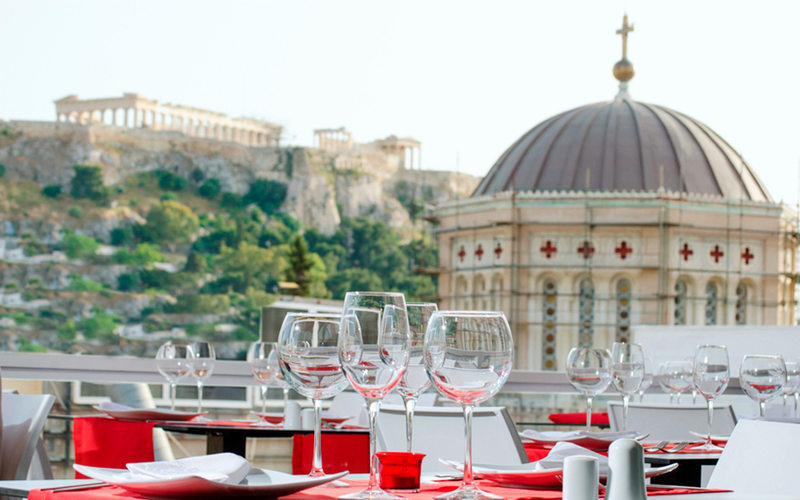 So much so that Athens is witnessing a wave of hotel openings. After a harrowing three years up to 2013, during which many famous hotels in the center of the capital closed down, architects, designers and builders found themselves busy again, assisted by the spectacular recovery of the city as a tourist destination. At least six new hotels, concentrated in downtown Athens between Omonia and Syntagma squares, are due to start operating within the next two years. 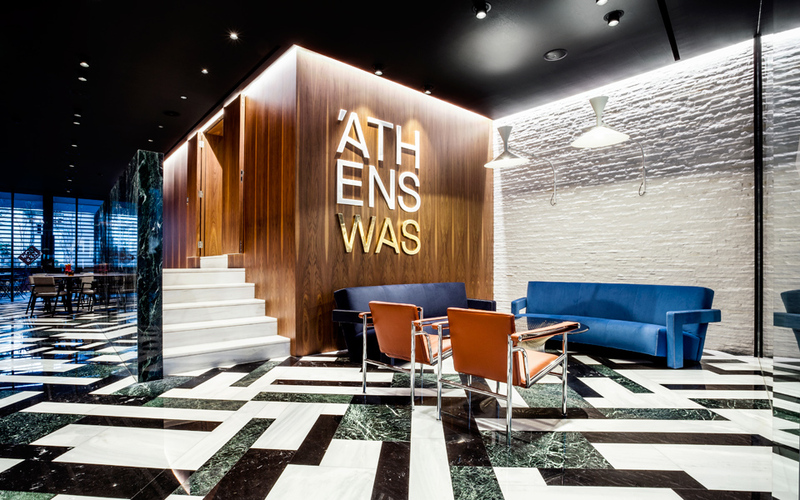 The lobby of the new AthensWas hotel which combines retro looks with a modern touch. It was obvious that Dionysiou Areopagitou, the pedestrian street which runs along the Acropolis, was lacking a hotel. AthensWas, established by a company that runs a five-star hotel on Folegandros island, opened in April 2015. 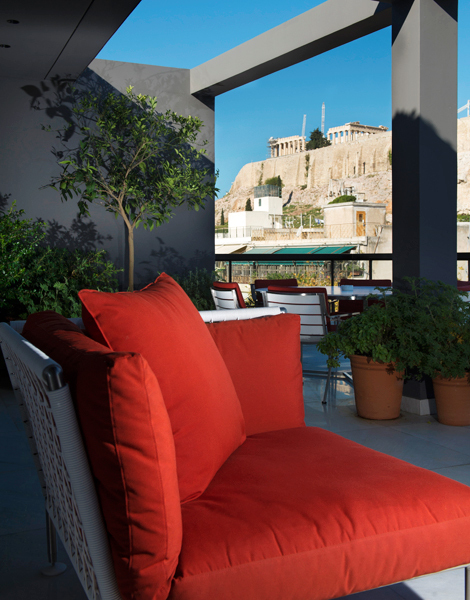 With a direct view of the Acropolis, this hotel operates in the heart of the tourist district. With the decisive contribution of Stavros Papayannis and George Kyriazis of Stage Design Office, the hotel’s owners opted for a quiet, leisurely modernism with touches of 1960s Athens. The simple lines and decoration hark back to a cozy period when Athens believed so much in the future. The interaction between discreet luxury and intimacy is repeated constantly. Greek marble in unexpected shades works in harmony with Greek walnut wood. The rooms and suites contain emblematic 20th-century furniture, including LC3 armchairs designed in 1928 by Le Corbusier, Eileen Gray’s the renowned sofas (1925) or Warren Platner’s famous table seating designs from 1966, combined with more modern creations from international designers. There are 21 rooms, generous terraces garlanded in jasmine, wisteria and other Greek climbing plants, and a rooftop bar with a breathtaking view. Coco-Mat, experts in natural bedding, are expanding their hotel venture into Kolonaki. The crews work nonstop at 36 Patriarchou Ioakim street, where the most observant Athenians know stands a stylish building dating from the 1930s. 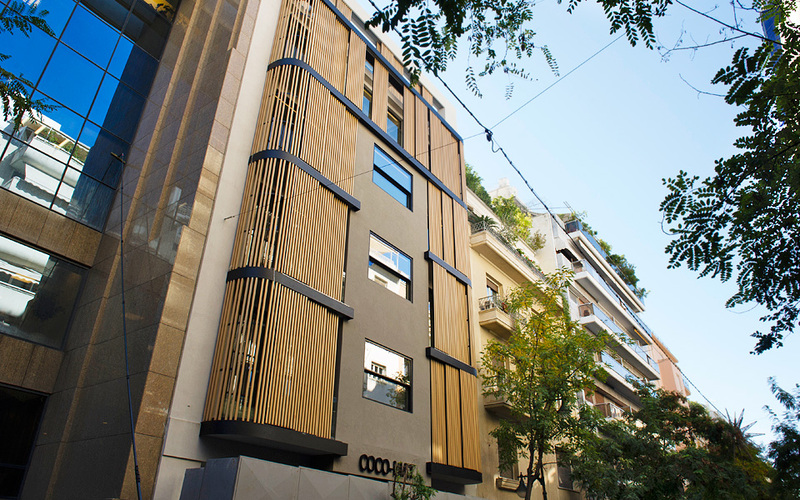 In the heart of Kolonaki, a new hotel is being developed by Coco-Mat, which opened its first, Hotel Nafsika, in the northern city suburb of Kifissia in 2012. The characteristic curves, staircase and frame of the 1935 structure have been preserved. 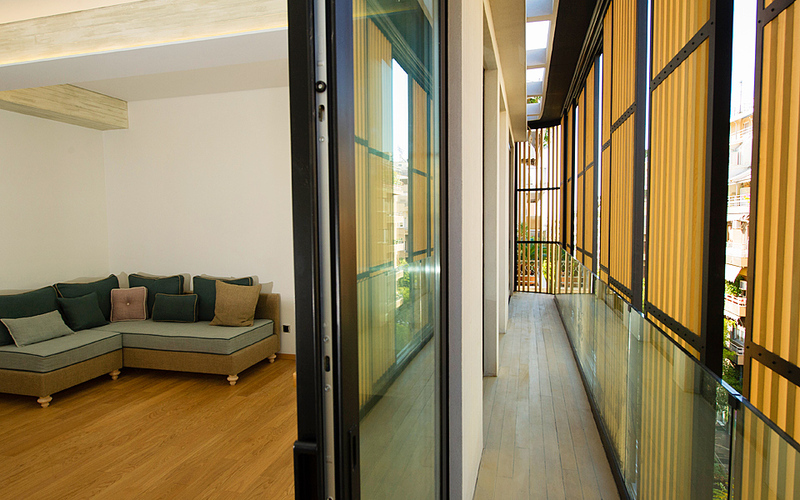 Sliding cedar panels allow guests to regulate the level of sunlight. The movement of these panels constantly change the external appearance of the building. Near the entrance is a small waterfall where love struck guests can join in the “lock your love” trend by leaving padlocks as tokens of their affection. The hotel will have 38 rooms and suites, while a Coco-Mat store will operate in the lobby. The Athens Status roof garden with its view of the Acropolis. Τhe old education ministry building on Mitropoleos street is currently being transformed into a 5-star hotel. Acropolis view from the "Hellenic Suite" of AthensWas hotel. The largest project currently in the central Athens hotel market is the transformation of the old education ministry building on Mitropoleos street, an emblematic building designed by architect Patroklos Karantinos, into a five-star hotel. Initially, the investors’ desire was to devise a new classical façade, but the plan was rejected in favor of retaining the modern exterior. The investment is expected to run to 15 million euros. The hotel will have 220 rooms, a swimming pool, restaurant, wellness center and conference area. New life is also being breathed into the former Fashion House Hotel in Omonia, which is expected to reopen as a four-star hotel in 2016. 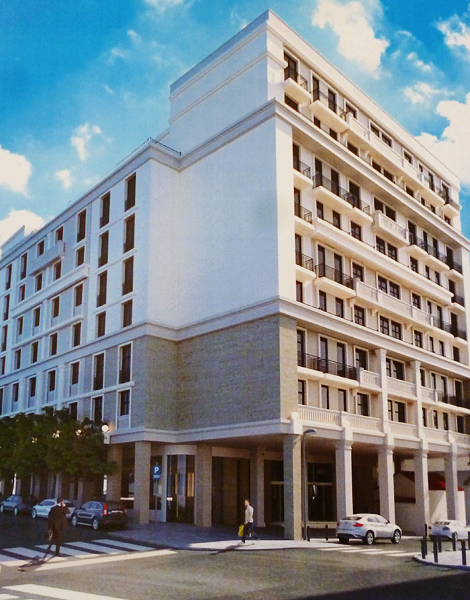 Operated by Mage Hotels and Resorts, it will have a capacity of about 120 rooms. A new era also beckons for the former Athens Lycabettus Hotel on Valaoritou street. Its owners, the Archdiocese of Athens, have begun seeking a new leaseholder to run the seven-storey building as a hotel. Another major hotel project is also getting off the blocks. The Hitiroglou textile company has reportedly reached an agreement to lease of the Kallimasiotis Mansion on Mitropoleos Street to Grecotel, which in early 2015 acquired planning permission to convert the 1925 building into a hotel.